Let me begin by acknowledging that I am not even remotely a fashion blogger nor do I consider myself "fashionable". But I do enjoy fashion and following it even though it may not appear that way! Like many over the past couple of weeks I have been soaking up all the fashion week shows first from New York fashion week and now London's. So many beautiful pieces but it was Burberry's Prorsum Fall 2014 show that has inspired this week's post. I like to believe that I'm not the only one that was expecting a line of camel trench coats and plaid scarves from this collection and thankfully I was wrong! Prints! Prints upon prints! I love a good print but I have no idea how to layer them. Burberry killed it with Prorsum! Stunning dresses and coats of pattern layered with fantastic patterned scarves and cinched at the waist with killer belts creating awesome silhouettes. BAM! What camel trench coats?! 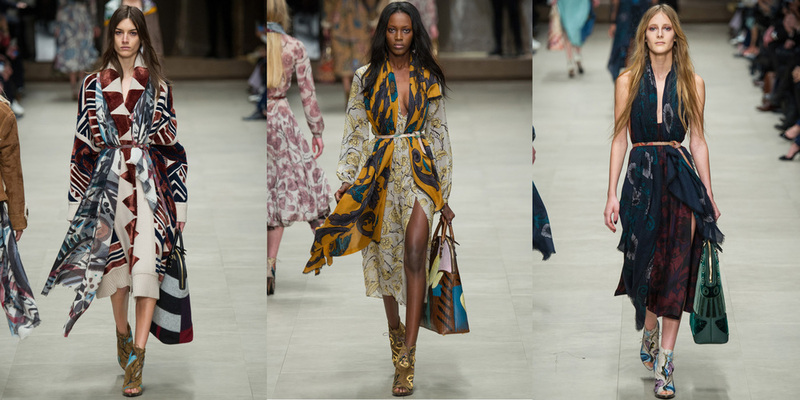 A collection of beautiful fabrics, oversized garments, rich colours, and giant, gorgeous scarves, Burberry sings to my heart with this show. Now to find the right event to attend where I can pull off the blanket draped over the shoulder look!